A year ago, Hong Kong’s pro-democracy protesters took to the streets in what would become a 79 day standoff known first as Occupy Central but ultimately the Umbrella Movement or Revolution. The fight of genuine universal suffrage and civil disobedience against Beijing’s control over Hong Kong is by far the largest public demonstration that the Special Administrative Region has ever seen. Hong Kong is controversially administered by the Beijing under a ‘one country, two systems’ policy, which has provided a degree of freedom that allowed for up to a million Hong Kongers to flood the streets over the 79 days in protest against changes to Hong Kong’s electoral system. The changes which have since been rejected would allow the Chinese government to screen all candidates in the first direct elections for Hong Kong’s Chief Executive Officer in 2017. The protests were loosely initiated by the Hong Kong Federation of Students and Scholarism, a student activist group who launched class boycotts in September 2014. The Occupy Central with Love and Peace movement joined shortly and its main leader Benny Tai declared that occupation of Central (Hong Kong) had begun in the early hours of 28 September 2014, elevating the protests to a mass civil disobedience campaign. 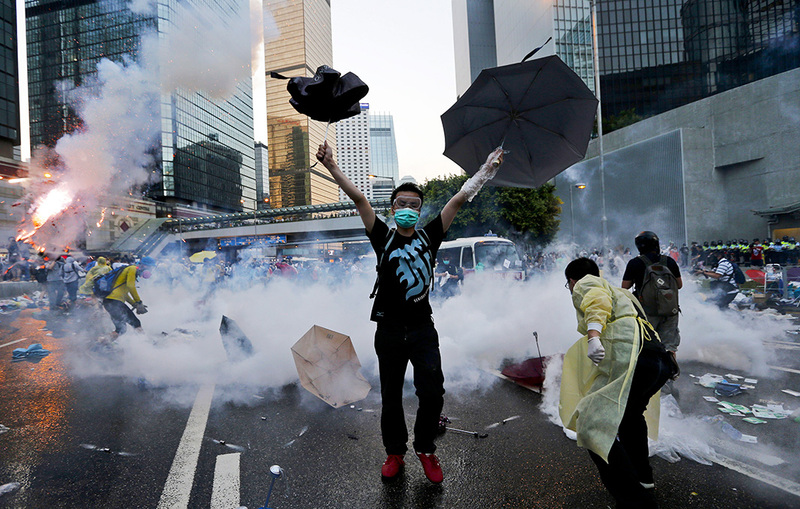 On September 28, the Hong Kong government reacted to the widespread protests by deploying riot police who used pepper spray, tear gas and batons to drive back protesters. Warnings of the potential use of live ammunition on protesters also surfaced with images captured and shared around the world of protesters using umbrellas and face masks to defend themselves. Over the next 3 months, Hong Kong became gripped by the most intense yet arguably peaceful protests despite accusations of violence from police and rival protesting groups. Social media played a large role in both the communication and development of events to the extent that the Hong Kong government accused services such as Twitter and Instagram of being evidence of foreign interference. One of the most popular apps was FireChat which relied on Bluetooth instead of internet connectivity for the transmission of messages among the crowd. The use of FireChat was trying to get around any potential government attempts to censor the internet and to cut pressure on telecommunications networks in the area. Rallies in support of the Hong Kong students, pro-democracy protesters and against the Hong Kong government and police brutality were held in over 60 world cities internationally. The Yellow Ribbon and Yellow Umbrella has been the symbol of Hong Kong’s struggle for democracy with the chant “We want genuine universal suffrage” being the lead catch cry. The Umbrella Movement created momentum for Hong Kong’s pro-democracy supporters, even though the protests ended without concessions from the government. Despite the Hong Kong legislature voting down changes that would have allowed for Beijing to screen candidates in the 2017 election, the struggle for democracy continues. Joshua Wong, a key student leader and pro-democracy activist has said that “Figuring out how to continue the Umbrella movement and [driving] Hong Kong people’s determination for a better future is key.” The student leader has also said that Hong Kong doesn’t need another Occupy Central but rather should be moving its focus towards 20147, when the supposed end of the ‘One Country, Two Systems’ model is set to expire. Will the Occupy Central Movement be the new norm in Hong Kong? Pro-democracy protesters are once again planning to stage a mass demonstration outside Hong Kong government headquarters in Admiralty to mark the first anniversary of the start of Occupy Central and the Umbrella Movement. The protesters will hold a silent protest beginning at 5:58pm on Monday 28 September – the exact moment when Hong Kong began police firing tear gas at occupation protesters in Central and Admiralty. Chan Shu-fai from the Civil Human Rights Front says that the 1 year anniversary protests are “to tell the government that Hong Kong people have not given up. We have not forgotten our original aim [of genuine universal suffrage and democracy]”. Student groups have also announced that they will be hosting a series of pro-democracy activities in Tamar Park near the Hong Kong legislature at the end of September to mark the occasion. Crowds are also expected to gather around the ‘Lennon Wall’ which was covered with pro-democracy post-it note messages during the Umbrella Movement. Hong Kong’s political situation continues to remain plagued by the inability of the government to pass legislation with a hostile legislature and a fractured socio-political psyche among the general population. Chief Executive CY Leung has also come under renewed criticism for his comments in which he asserted that he is ‘transcendent’ and as an official appointed by Beijing he should be able to supersede the other branches of government, executive and the judiciary in Hong Kong. The Chinese government has ruled out making any further changes to Hong Kong’s electoral system in the near future with the defeat of the electoral reforms in June this year. Previous Post:Turnbull – a loser in waiting or winner in the making?